President Blaise Compaoré of Burkina Faso spoke at a National Press Club Newsmaker news conference August 7, 2014. President Compaoré, speaking in his native French, took questions from the audience via interpretation. Burkina Faso’s President Blaise Compaoré said this week’s U.S.-Africa Leaders Summit only cemented his belief that U.S. cooperation -- not aid -- is needed to create jobs, boost production, and reinforce security in his country and on the African continent as a whole. “African people think we came here to bring [back] suitcases full of bank notes,” he said. Instead, Compaoré is heading home with what he called “financial commitments” from U.S. companies such as Monsanto, which began a partnership with Burkina Faso in 2008 when the country approved the use of genetically modified seeds by cotton farmers. Cotton production has grown by eight times since, Compaoré said, adding that Africa and the U.S. “need to involve the private sector” in order to ensure economic growth. He particularly urged investment in energy, which remains an area of major concern. “In Africa we have it all,” he said, listing resources such as coal, gas, oil, uranium, and water. But without an end in sight to the armed conflict in northern Mali -- Burkina Faso’s neighbor to the north –- Compaoré said U.S. military training and intelligence capabilities can make a difference. “We need to benefit from [their] advanced technologies,” he said. “The crisis in Mali … for me, it was a disaster,” he said, adding that not only was there a coup d’état, but also an “invasion” by French troops, a surge in “narco-traffickers,” and “groups calling for independence,” namely Ansar al Dine, an al-Qaeda offshoot. 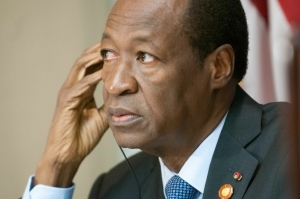 According to Compaoré, his mediation efforts with the Islamist group two years ago “secured an agreement” focused on “the integrity of Mali” and the movement of armed groups into barracks. Compaoré admitted he couldn’t predict the road ahead.